Kieran Keane held his first press conference in Galway on Tuesday. Connacht head coach Kieran Keane watches over training in Galway yesterday. NEW CONNACHT COACH Kieran Keane said that he has been blown away by the attitude of Bundee Aki. Aki, player of the season when Connacht lifted the Pro12 title 15 months ago, will miss the start of the season. He has yet to return to full training following an off-season shoulder injury, but Keane said he has been seriously impressed with what he has seen. “He’s progressing well, we’ve got a bridle on him at the moment, trying to hold him back. He’s champing at the bit, looking pretty good. He’ll have a second round return. Keane, like Aki, has come to Connacht from the Chiefs and his disclosure that he believes his Irish roots can be traced back to Waterford is going to ensure he will hear plenty about the All-Ireland final in the next few weeks. “We’re from Waterford. My great, great grandparents were from there, I’m led to believe,” said Keane. 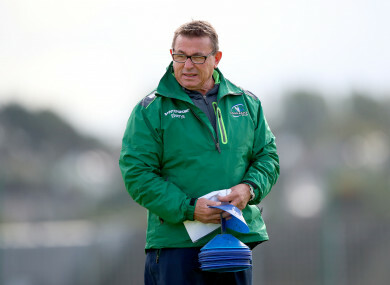 His top priority, having taken over from Pat Lam, is getting Connacht into the shape for the start of the Pro14 but has been pleased with what he has seen so far, even if there is a fair bit of work to get through before they kick off the season at home to Glasgow Warriors. In that game Keane will lock horns with his former Chiefs boss, Dave Rennie, and the new Connacht man said he had initially hoped to have been Rennie’s replacement, but was delighted to move to Galway in search of a head coach role. “I had aspirations to replace Dave. The reason I went to the Chiefs was to become the leader of that organisation. That didn’t happen. It came down to a two-horse race and I got second,” said Keane. “It was always my intention to want to go back to being a head coach so when I was offered that opportunity, particularly here, I saw it as a really good opportunity to get back to being a head coach. “I’m a terribly competitive human at the best of times, but I don’t think it would be interesting to talk about what I think (we can accomplish), can we do this and can we do that. Known as a slightly eccentric character from his time in New Zealand rugby, Keane earned the moniker ‘The Mad Professor’ because of his tendency to think deeply about the game. He says he becomes enveloped in the sport, and cannot stop dissecting his opponents and scheming on behalf of his team. “The unfortunate thing for myself is that I dream about rugby. I dream about it when I’m awake and when I’m asleep. “I have that mantle as you just described from a number of colleagues, because I am always trying to think ahead, innovate if you like. Innovation has always been part of my creed about playing the game and sometimes when you are listening to me you can get lost because I’m away with the fairies. Before their competitive games start, Connacht face pre-season challenges against Wasps in Coventry next Wednesday, before they welcome Lam’s Bristol to the Sportsground on Saturday week. Email “'He's a very impressive man': New Connacht coach blown away by Bundee Aki”. Feedback on “'He's a very impressive man': New Connacht coach blown away by Bundee Aki”.